We love our music gear very much and we would like to use it all the time. Unfortunately it is not possible to take all the gear to all our shows. So when you would go to see us live, you will probably hear some sort of mixture of amps and instruments according to the specific clubs or places. 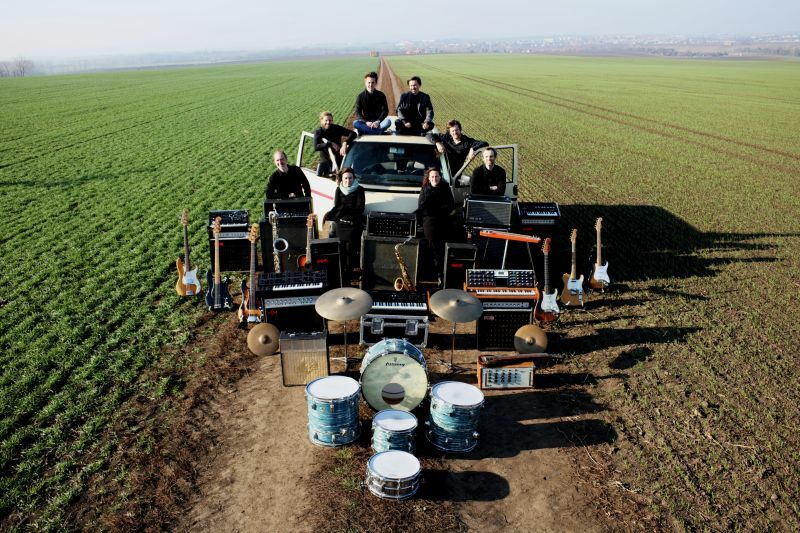 For now we take all of the gear only for shows in Brno Observatory and open-air in Rajec-Jestrebi. The list is not complete and it will be continually updated. 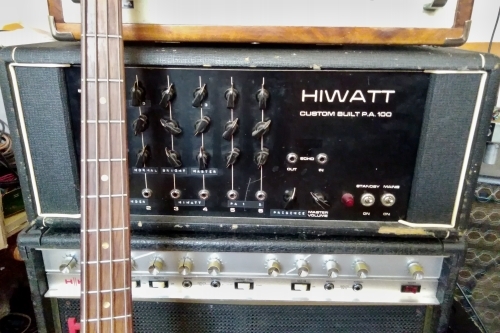 1969 Hiwatt P.A.100 with these features : Inuputs 1 and 2 Fender Twin reverb preamp, inputs 3 and 4 classic Hiwatt DR103, inputs 5 and 6 original P.A.100. End tubes 4xEL34 gives 100W, outputs are connected in that way that it is possible to use only with 2xEL34, therefore only 50W. 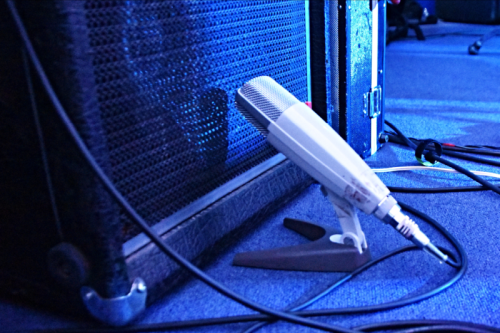 Clearly the loudest loudspeaker in the band. Classic piece of the 1970´s. 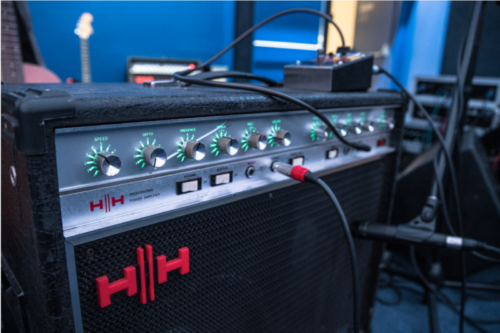 The HH electronics company was one of the first companies that was specialized in transistor amps. 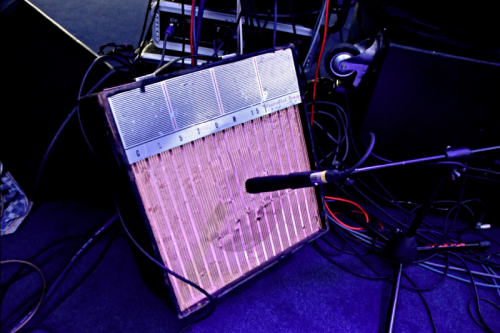 David Gillmour used HH for boost the signal to leslie boxes + reverb. Roger Waters used it as a preamp. 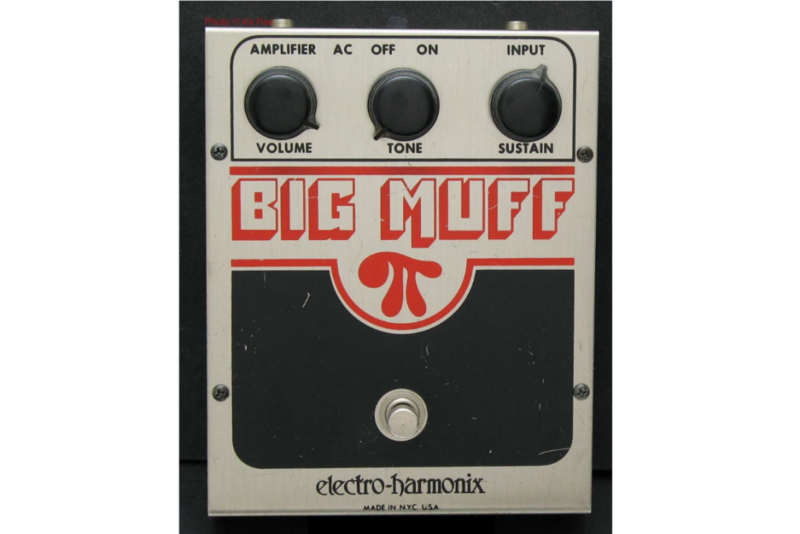 In the song One Of These Days it´s also used as a tremolo and overdrive. 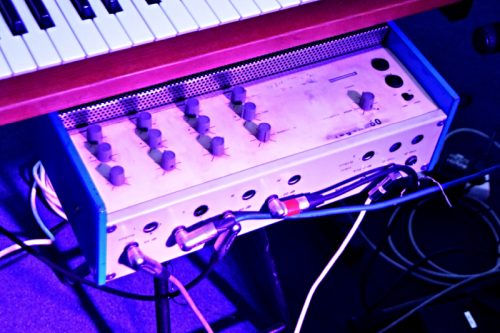 Rick Wright used it as a boost for keyboards. Interesting is the blue backlight of the knobs which was quite unique for its time. This little combo togeter with Selmer T’n’B creates the basis of the Syd Barret´s sound on the record The Piper At The Gates Of Dawn. All-tube, 15W. Guitar input has got only volume corrections and tone control. Combo is equipped with reproboxes 10″ Elac with high efficiency, two inputs and a tube tremole effect which was very famous in the 1960´s. Pink Floyd used the WEM reproboxes through their entire career and David Gilmour uses them till these days. 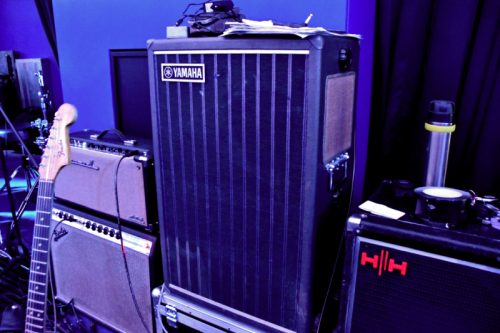 In our band you can find quite few of these boxes and besides them this 50W combo. 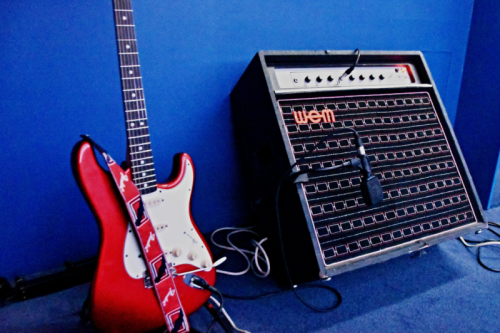 It belongs to the good examples of WEM amps in the late 1970´s. It´s equipped with a pair of Goodmans 12″ reproboxes. David Gilmour used the stronger version in the years 1976-83. You can hear it on the records Animals, The Wall and on the solo project named David Gilmour. This 200W leslie box from the year 1976 has three rotating speakers in the upper part and four 12″ 60W stationary boxes in the main body. 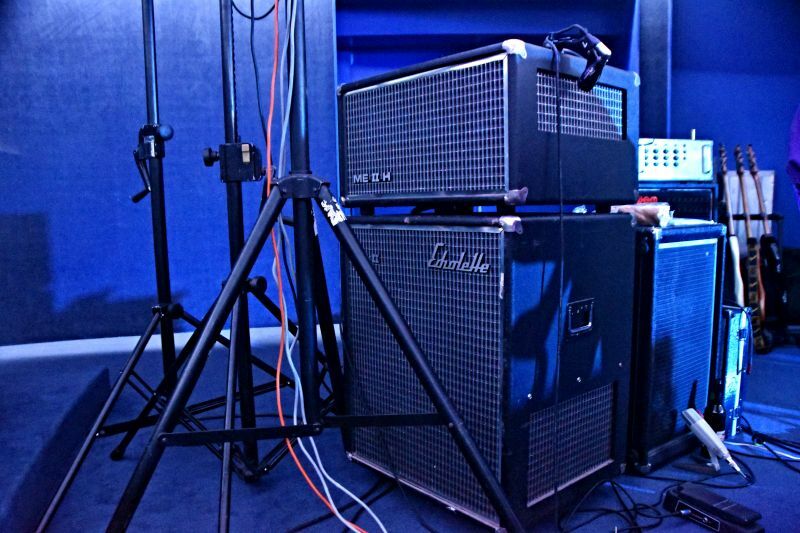 Leslie boxes and Hiwatt amps were the key elements of the David´s sound through his entirely career. Pink Floyd used these all-tubes 4-inputs amplifiers for the complete sounding of the band so primarily for vocals, keyboards and drums. It was quite efficient amp for those days. Syd Barret used the model “Treble and Bass 50 W” from the same manufacturer for the guitar. 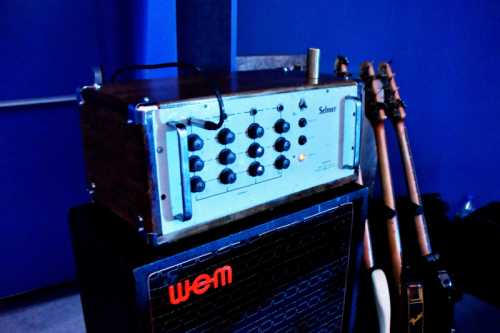 The same was used by David Gilmour during the recording of Saurceful Of Secrets. The amplifier was made in 1966. Leslie box with rotating horns of the reproboxes. All-tube keyboard amplifier from the end o the 1960´s. If you recall your favourite guitar solo from David Gilmour, you will probably listen to Big Muff. Overdrive which produces the typical fat almost violin tone accompanies Gilmour from the 1976 to the present. History of this box comes to the end of the 1960´s and the circuits connections went trough many changes during the time. David Gilmour uses primarily “Ram´s Head 3003” version from the 1973 but later he uses also the russian variation “Civil War” (e.g. on the P.U.L.S.E.). 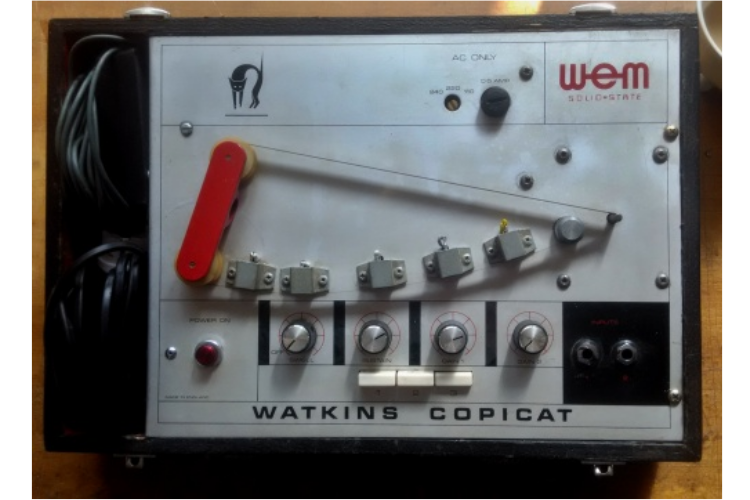 The most famous Tape-Echo Unit in Britain, and possibly in the World, the Copicat also happens to be the first repeat-echo machine manufactured as one compact unit. It was designed by Charlie Watkins in 1958. Classis phaser effects from the mid of the 1970´s that were used for guitars, basses or keyboards. Small Stone is equipped with four phase cells, Bad Stone has even six pairs. 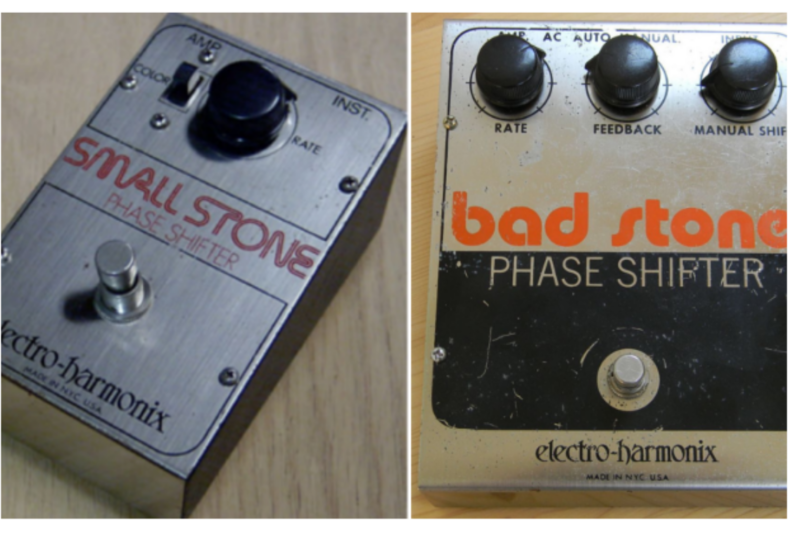 Bad Stone was first phaser with a regulation of feedback and contains so called manual mode which is possible to set the phase manually instead of using low frequency oscillator. 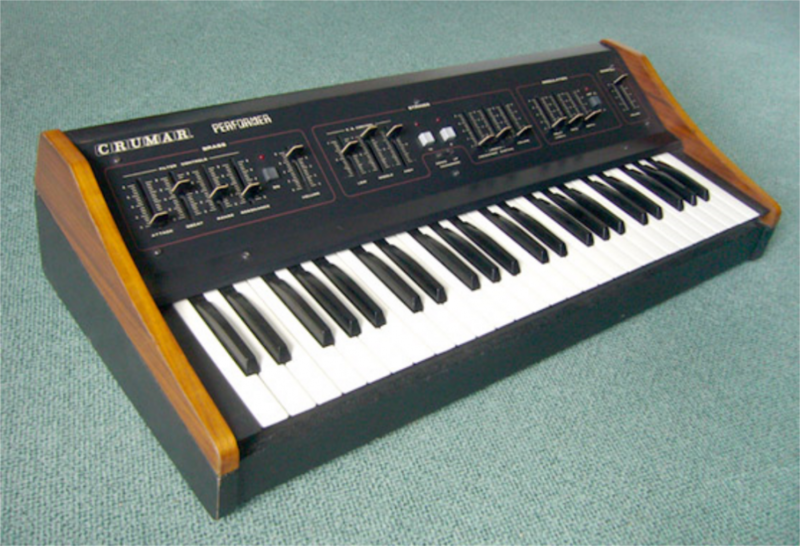 Model Voyager is enhanced version of the instrument from 1970. 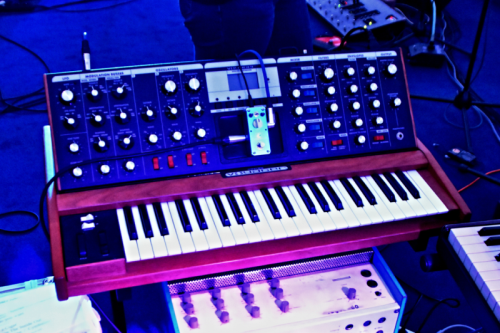 Bob Moog started with its production in the 2001. 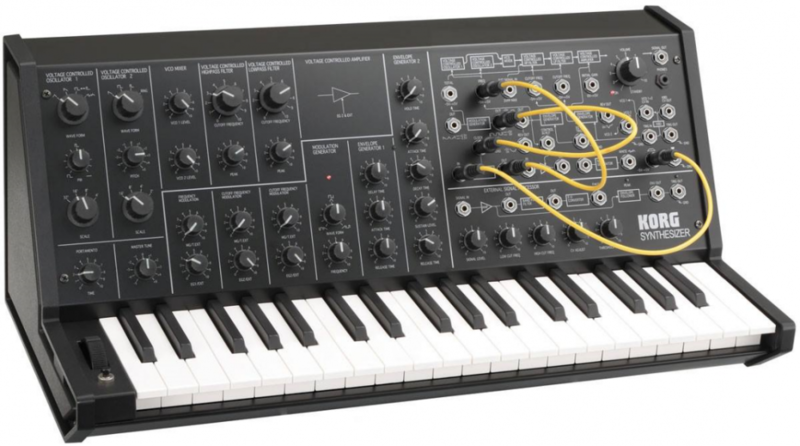 Besides the analog circuits its got plenty of new functions like modulation, memory, dynamics and many others. Monophony japan analog synthetizer from the year 1978. It´s got so called semi-modular architecture. That means that besides the common way of the signal we can connect the individuall blocks of the synthesis with cables as it were done in the 1960´s. So there are plenty of sounds available but you can set only one particular colour of the sound at the time. Therefore it´s quite limited for live playing and we bring it very rarely to the gigs. String machine Crumar Performer with full polyphony, brass section and equalizer. In the combination with Small Stone from Electro-Harmonix it makes sound basis for the middle part of the song Dogs. The instrument was made in the 1970´s. When you would went through the reviews of the Pink Floyd live shows from the first half of 1970´s (e.g. The Dark Side Of The Moon) you will find very laudatory opinions on the sound of the band. That was quite unusal these days. The band used ordinary amplifiers HH and WEM reproboxes but instead of Schure microphones they relied on the german company Sennheiser. Their famous series MD4xx is still used in recording studios, classic microphone MD421 is still used for recording drum toms. Vintage Ludwig 60 039 s Keystone Badge Supraphonic Snare Drum. For most of the drummers of the 60´s and 70´s era was the legendary big sound of the Ludwig drums a keystone. Ludwig drums was made of three layers – maple/poplar/maple which made this specific warm and compact tone. 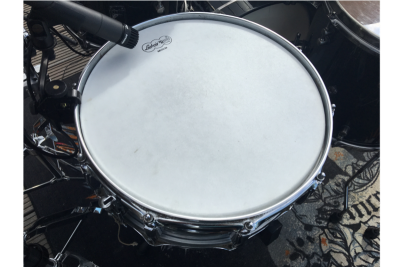 In our drum set you can find bass drum 22″, toms 13″ and 16″, snare drum 14″ Supraphonic which we sometimes alternate with its old model from the 60´s. Hardware is completely contemporary expect for bass drum pedal and stool. Paiste cymbals from the series 602 and 2002 are from the 70´s. Their identification sign is greaty dynamic sensibility and soft tone.